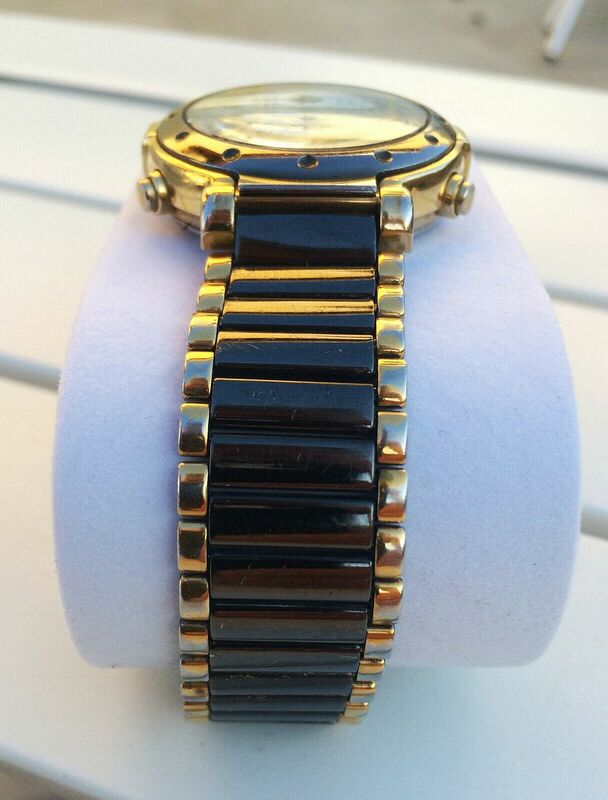 This gunmetal / gold two-tone 7A38-6090, sales code SAA134J, the rarest of the 7A38-6090 variants was listed a few days ago by an Italian speaking Dutch eBay seller. 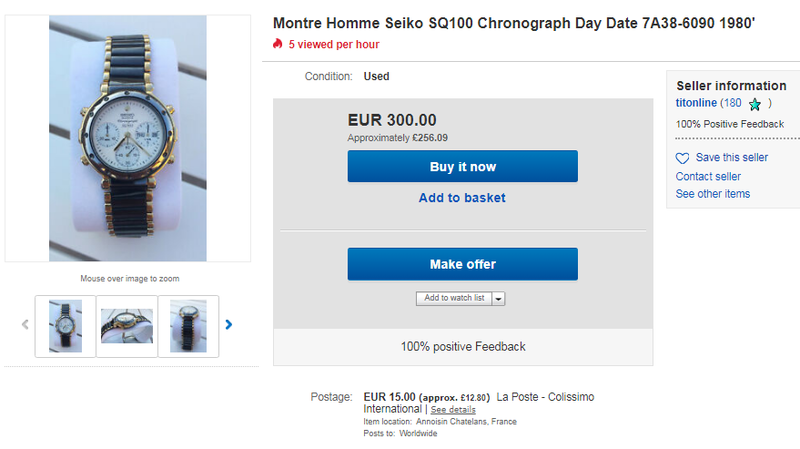 It's a non-runner, with what possibly appears to be a short bracelet, but priced to sell accordingly, with a Buy-it-Now price of 59 Euros, or option to make an offer. 2. CARATTERISTICHE: DETAILS : - YEAR : Around may-1987’. - CASE SIZE : 36 mm - BETWEEN LUGS : 16mm. 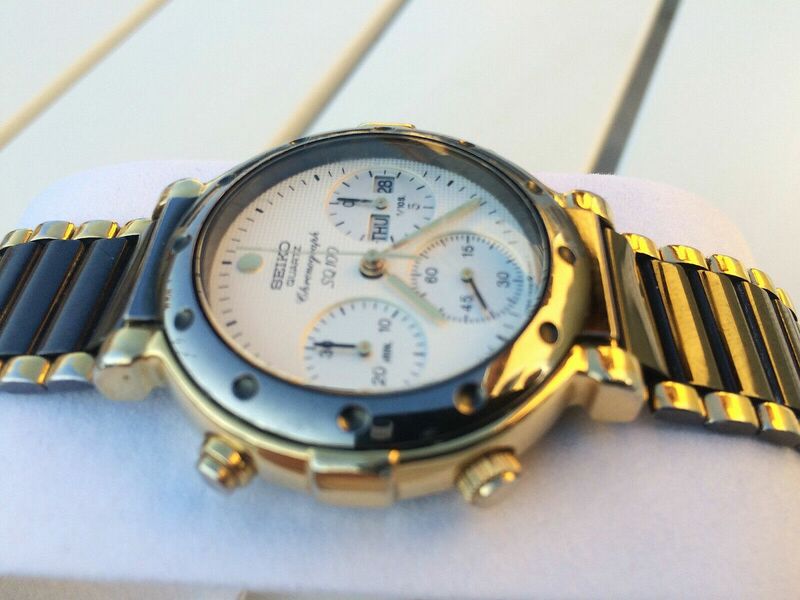 - WORKING: need service - CRYSTAL : 75% good - DIAL : good - DATE DISPLAY : yes - DATE QUICK SET : yes - DAY DISPLAY : yes - DAY QUICK SET : yes - CASE : 90% good – BRACELET: original. 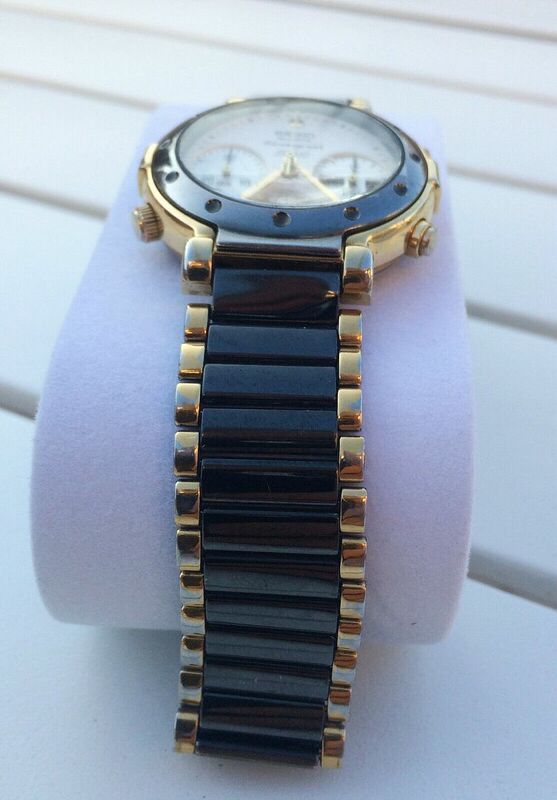 The above gunmetal / gold two-tone 7A38-6090 sold this morning, but for rather less than the seller's not unreasonable 59 Euros Buy-it-Now asking price. 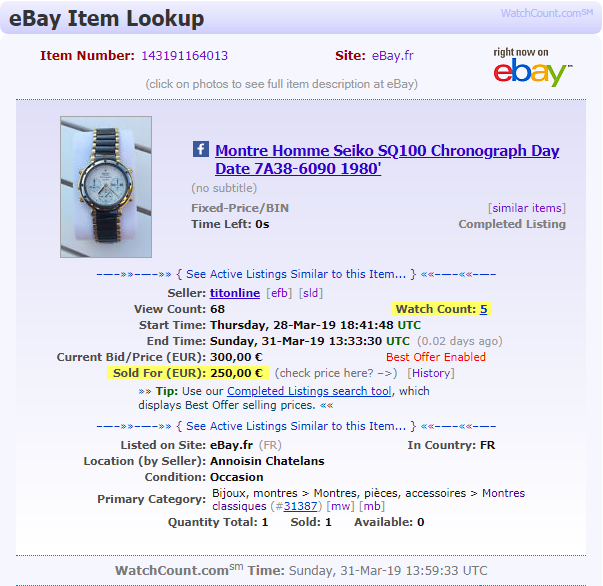 WatchCount.com's Look-up tool reveals it actually sold for a much lower sole offer of only 30 Euros. I must admit, I had thought about putting in an offer myself. In hindsight, particularly in view of the giveaway price the seller let it go for, indeed I definitely should have. If nothing else, it might have yielded a couple of bracelet adjustment links for my own ongoing restoration project. Oh well. This allegedly 'NOS' (but pretty obviously used) stainless 7A38-6090 was listed yesterday evening by an Italian eBay seller, with a typically wildly over-optimistic 'pie-in-the-sky' Buy-it-Now price of 750 Euros. 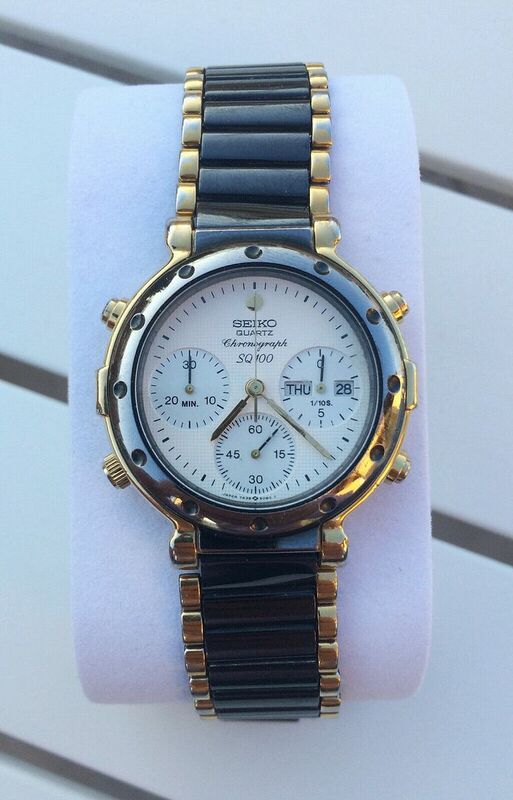 The seller falsely claims condition to be - “Never worn, only exposure! !” (whatever the latter part is supposed to mean). 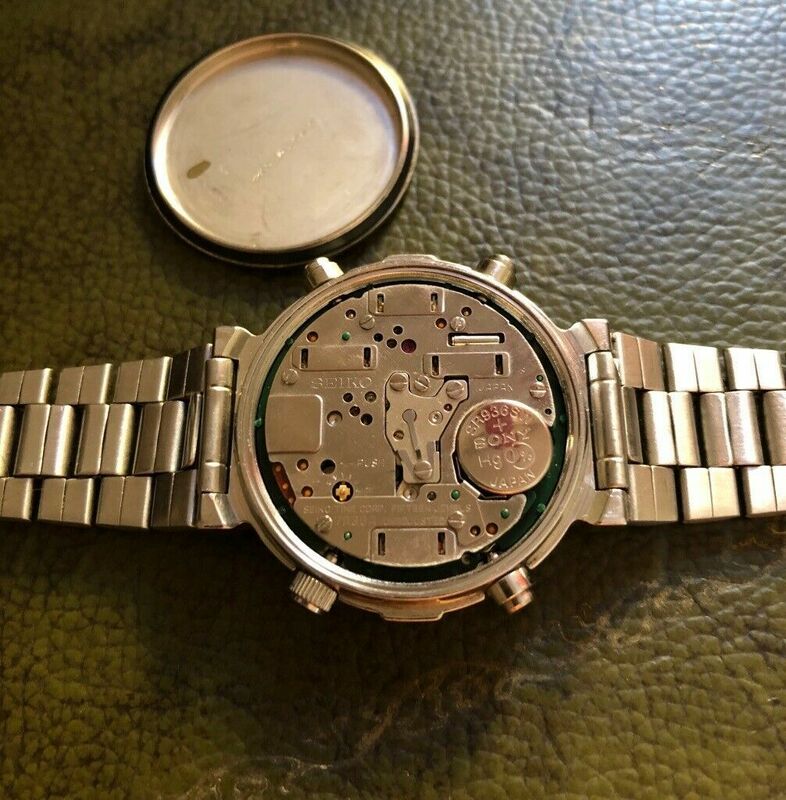 Although it appears to be in fairly decent well-cared for cosmetic condition, this watch has clearly been worn quite a lot. You've only got to look at the JWC inspection sticker on the case-back, which is virtually devoid of printing and discoloured by sweat, to figure out that much. 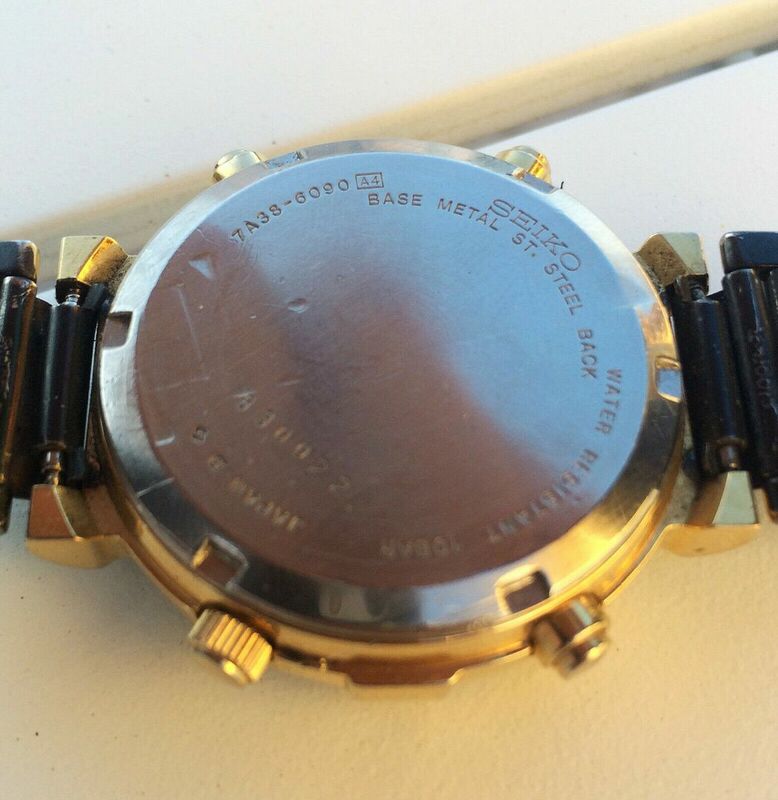 The close-up head on view also shows DNA evidence between the bracelet links on the 12 o'clock side. 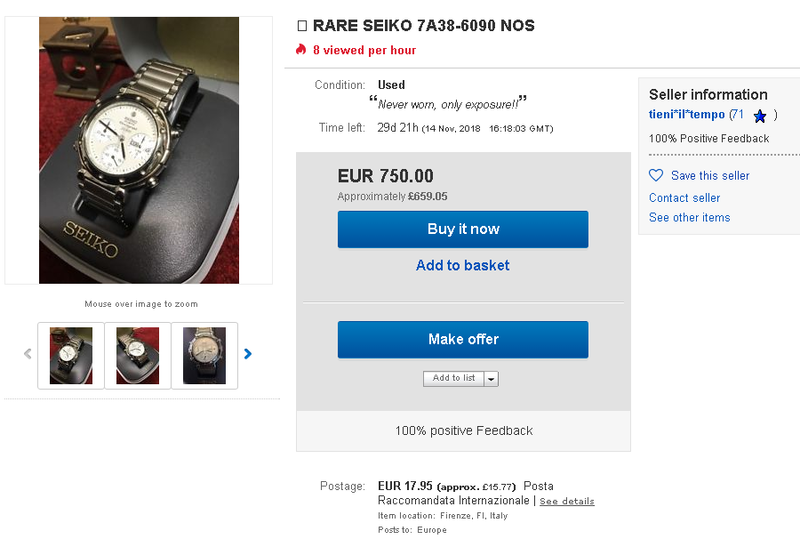 The Italian eBay would-be seller of that supposedly 'NOS' stainless 7A38-6090 had re-listed it at least 5 times (as 30 days listings) since mid-October last year, without making any reduction in price. Earlier this week, he ended the latest re-listing early, because of an error. (It's not the first time he's done that.) 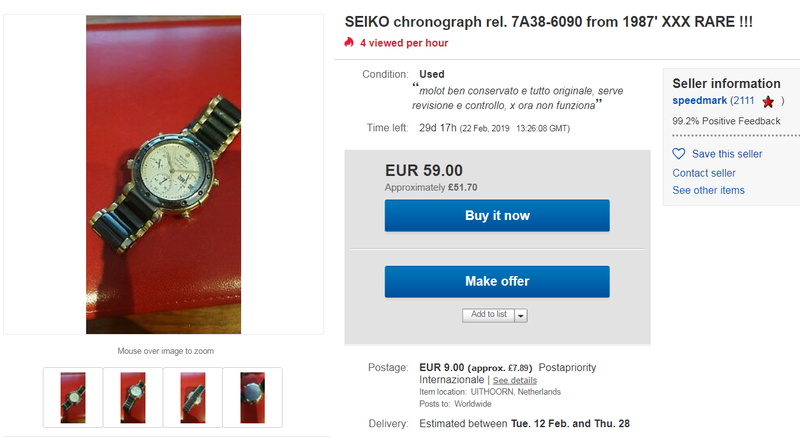 One can only assume that the error(s) were in his description of its condition and the pricing. 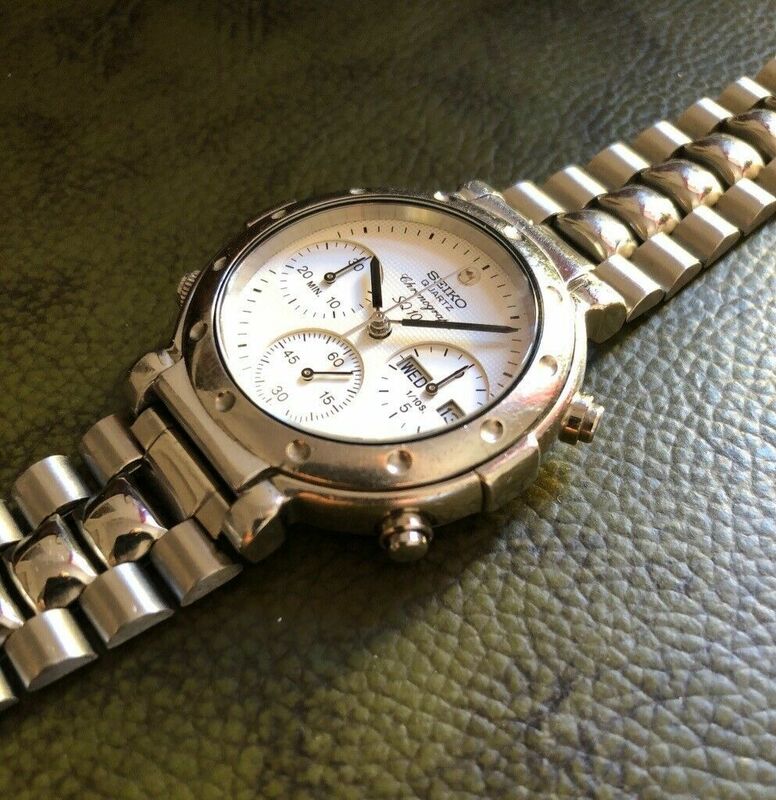 Well perhaps the gaudy two-tone gunmetal and gold plated 7A38-6090 SAA134J isn't quite as 'rare' as I'd first imagined. 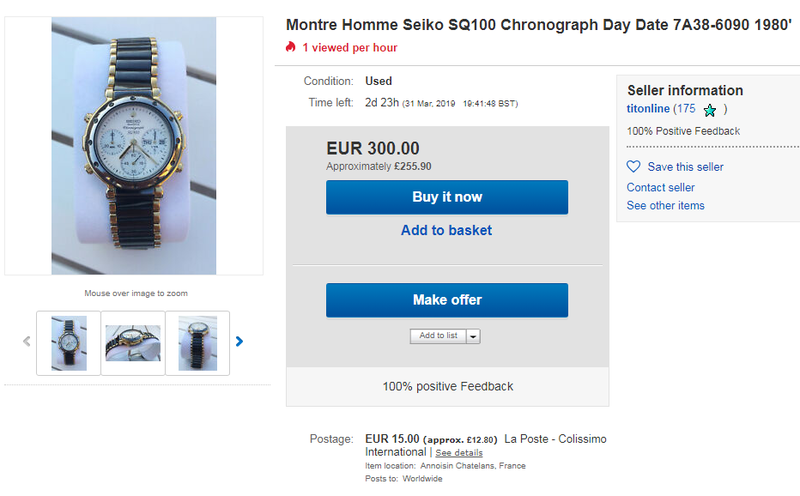 Another example (now the 4th I've seen from memory), this one in average worn condition, was listed earlier this evening by a French eBay seller, with a laughably over-optimistic 'pie-in-the-sky' Buy-it-Now price of 300 Euros, or the option to make a much lower more realistic offer. Montre en très bon état cosmétique et en très bon état de marche. 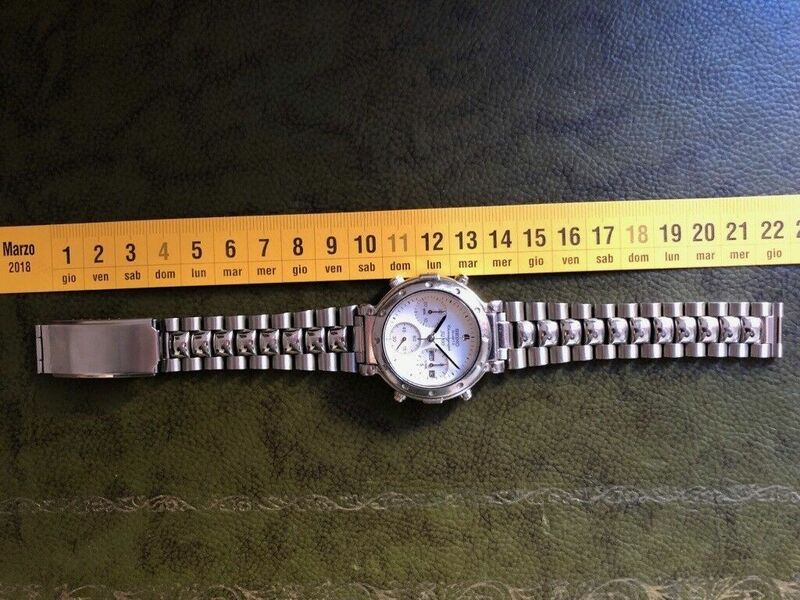 This stainless 7A38-6090, fitted with what has to be said, is a rather ugly looking generic stainless replacement bracelet, was listed earlier this evening by Italian eBay seller contintasca as a 7-day auction with an opening bid price of 150 Euros. 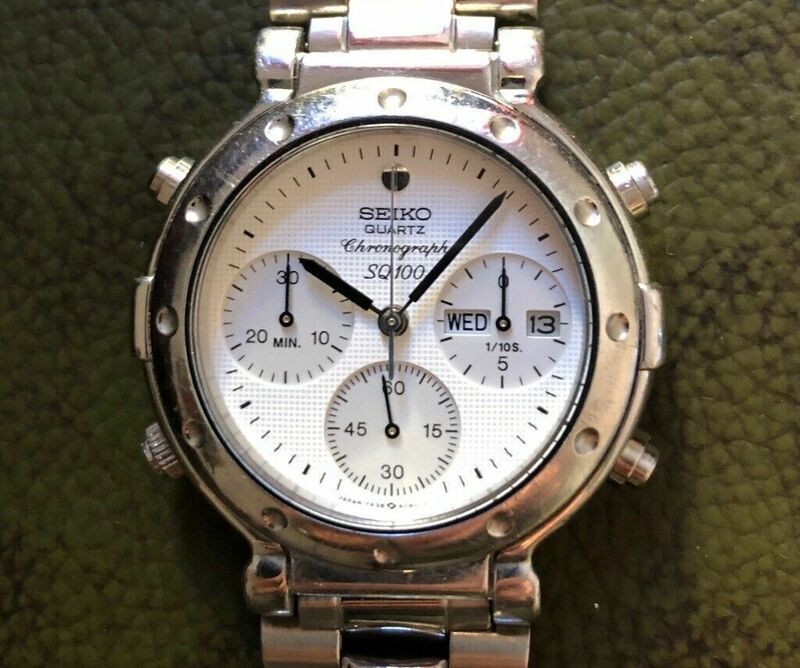 Up for auction is a Seiko 7A38-6090 Quartz Chronograph from 1988. 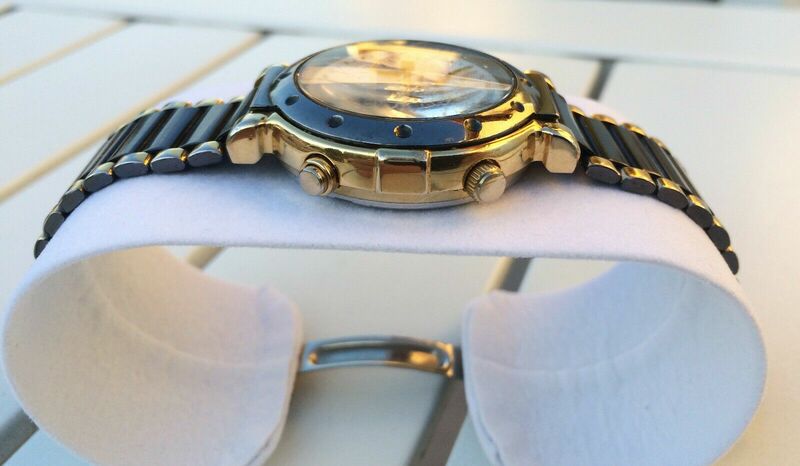 The 7A28/7A38/7A48 models by Seiko were the world's first analogue quartz chronographs. With 15 jewels and 4 independent fully metal drive trains they are utterly serviceable and rightfully regarded as among the best and sturdiest quartz movements ever made. 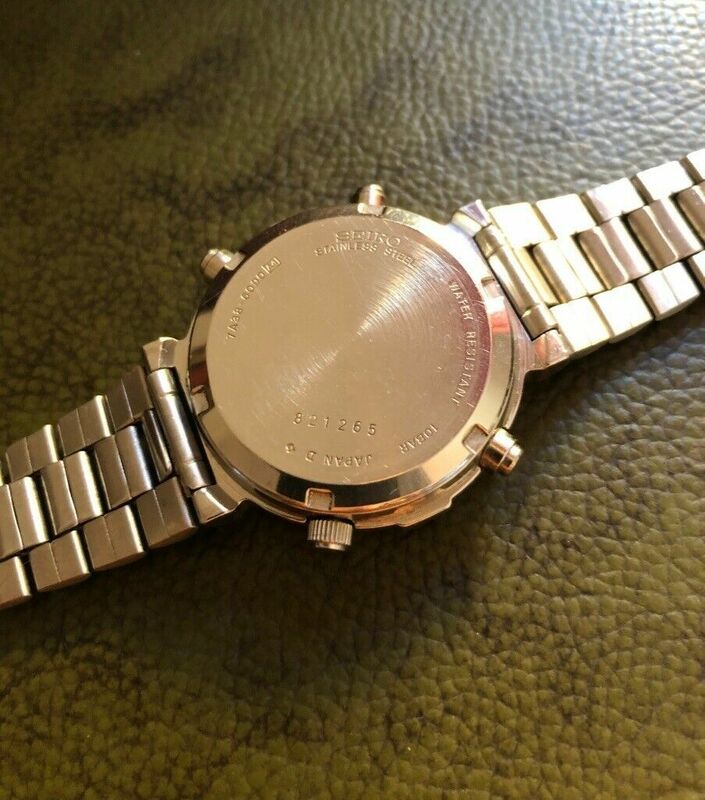 This watch has been stripped down and serviced with Moebius synthetic oils and works as it should. Please refer to the photos, they are an integral part of the description. Any questions welcome. Check out my other auctions. 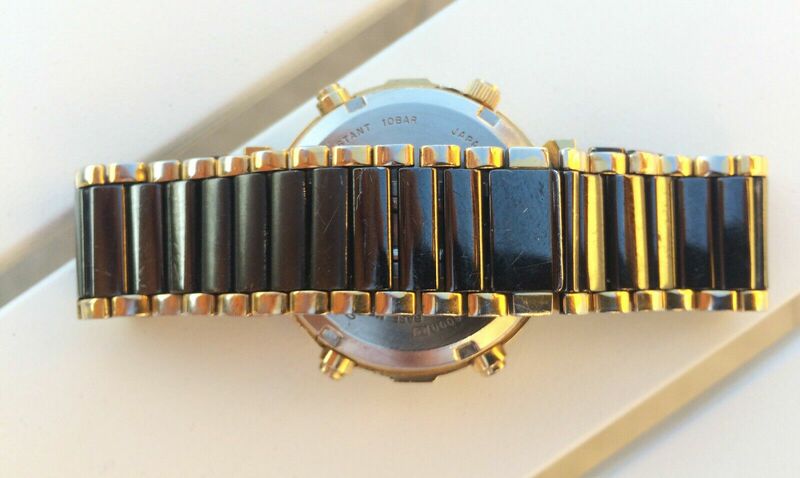 Much to my surprise, the gunmetal / gold two-tone 7A38-6090, listed by the French eBay seller a couple of days ago, sold earlier this afternoon, rather quicker than I'd expected. It didn't sell for the 300 Euros Buy-it-Now price either, but again a rather higher figure than I might have expected one of these to achieve. 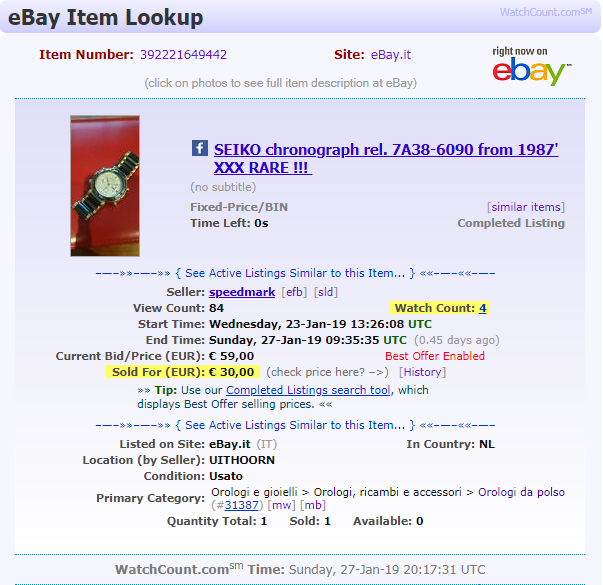 WatchCount.com's Look-up tool reveals it actually sold for a best offer of 250 Euros. Ha ! I thought that was too good to be true. It's back on eBay again this evening - re-listed a couple of hours ago. 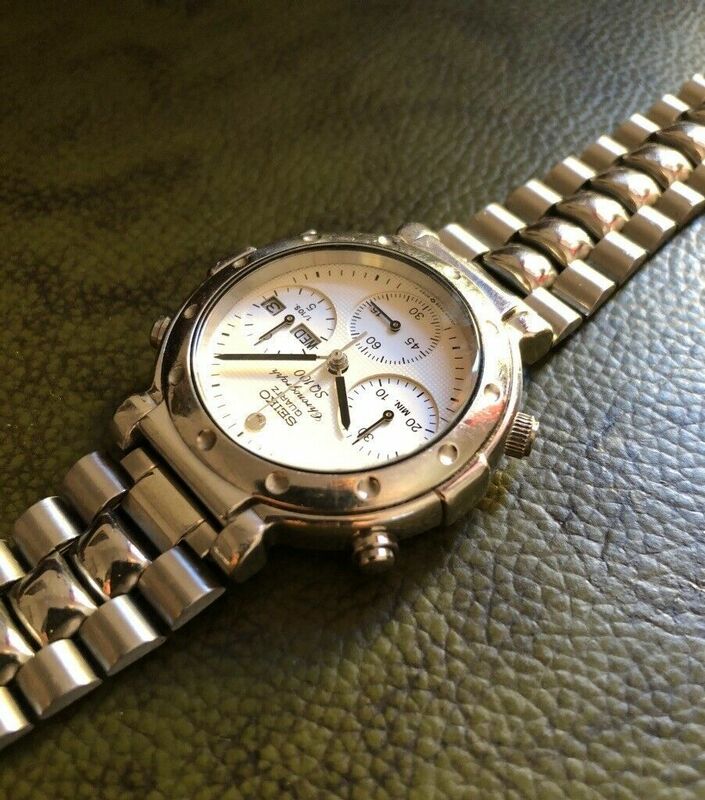 The stainless 7A38-6090, fitted with an ugly looking generic stainless replacement bracelet, listed at the end of March, by Italian eBay seller contintasca had failed to attract any bids. 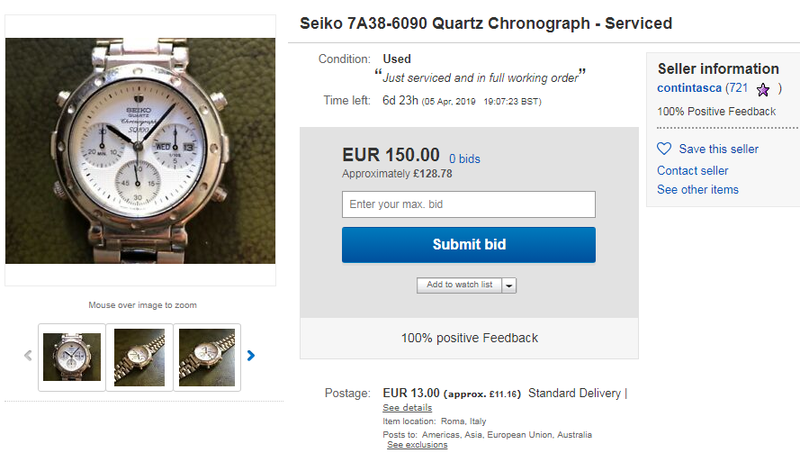 He re-listed it as another 7-day auction, with the opening bid price reduced from 150 Euros to a more realistic 120 Euros. 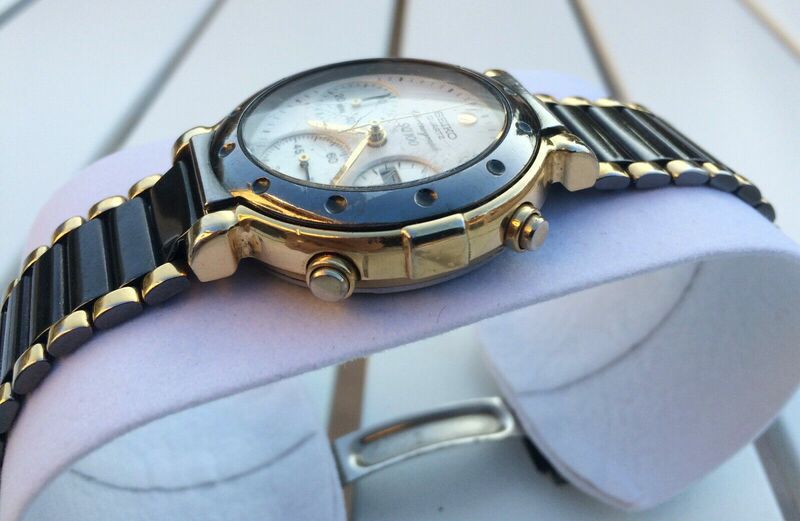 The re-listed auction ended yesterday evening, with the 7A38-6090 selling for that reduced opening bid price.